Everest & Jennings introduces the Traveler® L3 Plus as the lightweight wheelchair addition to the Traveler® line, a brand respected for performance and durability. The Traveler® L3 Plus lightweight frame weighs less than 36 pounds making it the ideal K0003 Medicare coded wheelchair built for short and long term use as well as rental needs. 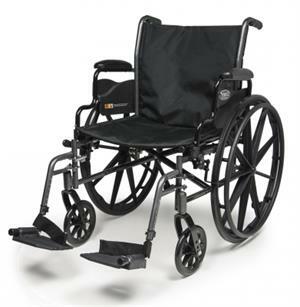 This lightweight wheelchair comes standard with non-marking polyurethane tires, industry compatible front rigging and adjustable anti-tippers along with a detachable 2" seat extension with hardware. It features a dual position axle, multi-position caster forks for 18 or 20 inch seat height adjustment and offers fixed flip-back desk length arm options for easy lateral movement. The Traveler® L3 Plus is manufactured with the same commitment to quality Everest & Jennings is known for.